Take a pre-test look down the line of attackers lining up for your test, and you’ll probably see every possible attacker type represented. Here is my basic list. Did I omit any? 1. The Poor Attacker (Regardless of rank, this attacker is just not all that good at trying to hit people): It’s probably safe to say that the martial appeal of your test can be affected by the skill of the attackers in your attack line. At one point in one of my attack lines on the way to sho-dan, a former student that we playfully nicknamed “Root” because of his extreme stiffness, and general fear of falling came staggering out of the attack line towards me. He was literally falling forward in what may have been confused as a running version of the standard zombie attack you see in any “Walking Dead” episode. In retrospect, I think the card must have read “Lunge at man’s throat with both hands.” Anyway, with Root staggering wildly towards me, and hands out in front, he was completely off balanced when I executed a last second tenkan to move out of the way. In fact, before I could even “hook up,” I watched him literally stumble and fall face first down onto the mat. At the time I was actually disappointed that I could not secure the Elbow Chop, as that was my intention, but looking back I now realize that when the attack is “THAT BAD” you really don’t need technique as much as you need simple, effectively evasive movements or even a well timed and placed atemi. One other point about the poor attacker or the poor attack. While we don’t like them as test takers, it is quite possible that the poor attack is the most likely attack you will see on the street (think of some drunk guy at a party or something) ~ so embrace your evasive footwork movement when you see a poor attack on your horizon. 2. The Incomplete Skillful Attacker: Presents a Skillful Attack But Does Not Have All 50 Techniques: To date, the first test I participated in for sho-dan was the best test I have witnessed and or participated in. I was a new blue belt with nearly passable ukemi. Joe Nocham handled my attacks skillfully, but also with understanding. He never busted out the Scissors on his attack line on me or anyone else who did not have that technique, etc. His attacks were perfectly in line with techniques held by the prospective attacker. 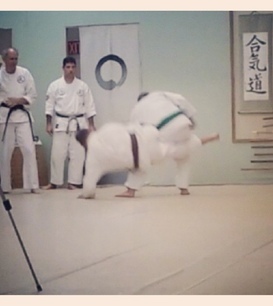 BTW, I’m preaching to the choir here, as I actually did bust out an exquisite Scissors on a green belt during my own sho-dan test (See picture to the left). Thankfully, I got lucky and my uke did not get hurt, but that is not license to try again. So generally speaking, when you’re training, you’ve always got to be able to control your impulses, and the power of your technique even if it is basic. I was recently speaking with a senior belt holder in our style, and he remarked that his wife used to study Nihon Goshin Aikido. When I asked if she was still active, he replied, “No ~ while she was training, someone really cranked her wrist, and injured her.” This, future sho-dans, is exactly what we want to avoid. 3. The Skillful Attacker Without Excellent Ukemi Skills: Describes most of us, and represents a serious challenge for nage. 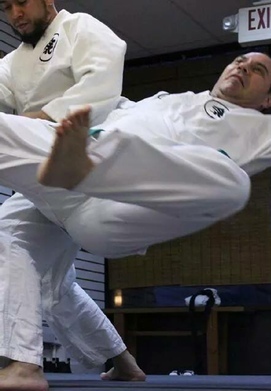 When I was a brown belt, I was an attacker in another person’s sho-dan test. On nearly every multiple attacker card, he executed a very aggressive application of the Body Block. The first multiple attacker scenario he had (the card read, Attacker A & B: Bring man down by any means necessary), I attacked with my partner. As we rushed at him, he entered dynamically and dropped out from underneath me ~ essentially executing a forward roll into my knees. I felt my left knee just beginning to hyperextend ~ before my momentum took my feet out from under me, and I was able to execute a spectacular diving forward roll that probably covered 8 feet in the air. I was ever so close to a serious knee injury on that attack. When he did it to me a second time, and I realized he had no concern for my safety. On my own sho-dan test in 2013, there was an opportunity to execute a Body Block off the same attack card (Attacker A & B bring man down by any means necessary), and as my two attackers rushed at me, I thought “Body Block! Body Block!” but the guy who took the lead in the attack had a bad knee, and was also really tall. The Body Block would have worked in the most dynamic of fashions had I used it, but it would have been very dangerous for my uke. I circled wildly instead, which was enough to cause the lead attacker to fall down without the application of any technique. As the remaining standing attacker continued his pursuit, I continued turning and inadvertently circled back into the path of the first attacker, who was now positioned on the ground. He wisely grabbed my ankle and tripped me as the second attacker secured a bear hug around my torso. We went flying, and what followed was an amazing ground fight. I appreciated my Gracie JJ cross training experiences. That said our defenses against committed and quality attacks should bear in mind the quality of our attacker’s ukemi, and uke’s general safety should be of concern . The BEST way to injure your Uke ~ demonstrated here: Perform a technique he has never been taught in a free flowing attack line. This is during my attack line for Sho-Dan. I like the picture. I just wish the Uke had a purple belt on. Uke’s fall looks worse than it actually is. This is an application I evolved over time. I use it regularly. It’s a cross between a Body Block, Pivot Over the Back, Back Breaker, with a little Muggers Throw thrown in for fun. 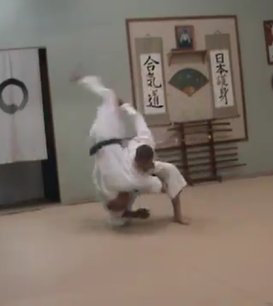 While the fall is surprisingly easy, it’s still not a technique you want to bust out on someone with out confidence in their ukemi abilities. Before my attack line test, I did this technique on every attacker to make sure they were ready for it. 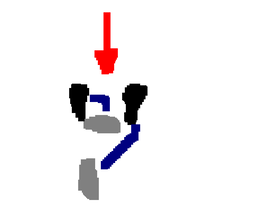 The Tenkan Movement into Hamni: A simple pivoting/ turning movement directly back and ever so slightly off line. It provides immediate flanking opportunities, and works especially well against committed straight attacks (like a 1 hand push). @ 15 seconds, you can see the application (depicted in the picture above) in full motion.